Rich in history, Lisbon is a city packed with attractions, surrounded by rugged mountains and the Atlantic coast. Sintra; with its palaces, mansions and gardens. Take a short break and visit the charming city of Lisbon. 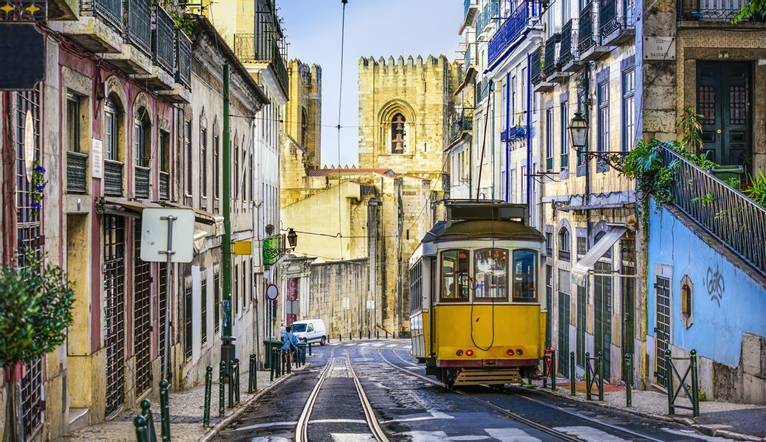 This delightful capital city allows us to stroll through narrow cobbled streets to the castle, see where ships sailed for unknown worlds and taste traditional Portuguese foods and wines. Built on 7 hills at the mouth of the Tagus River, Lisbon is a lively and friendly capital filled with sights and culture. A guided tour gives us our first taste of this ancient yet cosmopolitan city with an introduction to the attractions and wonderful history. There are painted, ceramic blue and white tiles everywhere, many beautiful churches and an abundance of fountains. Afterwards we can spend time discovering further sights, and, of course, fabulous shopping opportunities or sourcing out some Pastéis de Belém. Hot from the oven, dusted with cinnamon and icing sugar, these have to be the best custard tarts in the world! With a full day at leisure we can explore Lisbon or alternatively take an optional tour to visit the little town of Sintra as well as Cabo da Roca; the most western point in mainland Portugal, Cascais and its municipality of Estoril. The beautiful town of Sintra is full of palaces and gardens set against the backdrop of lush hills with many historic mansions. Often said to be the ‘Disneyland for grown-ups’ perched high above this UNESCO town is the Pena National Palace with its beautiful Moorish architecture and luxurious gardens. The once sleepy fishing town of Cascais is now a much-loved ‘playground’ with its winding lanes peppered with boutiques, local fish restaurants and small museums. The areas of Cascais and Estoril are now mentioned as the most expensive places to live in the country! This bright hotel offers a cosy restaurant and bar. The bedrooms are colourful and feature flatscreen TV, air-conditioning, minibar, safe, hairdryer and complimentary Wi-Fi. The transfer time from Lisbon Airport to Hotel 3K Barcelona is approximately 15 minutes depending on traffic. We include a guided half day walking tour of Lisbon. Listed below are just a few of the optional tours that may be available to you depending on the time of year and numbers interested. Prices should be used as a guideline only, as these could vary, depending on numbers, as these trips may run as private trips or you may be joined by other holidaymakers. All tours can be paid for in local currency (Euros) but in cash only. The exact amount will be given at your Information Meeting. Your Tour Leader will help arrange these for you but may not necessarily accompany you. Departure from Lisbon to visit Évora, - Patrimony of UNESCO - a walled town since Roman times, that is now most attractively Moorish in character with alleys cut by arches, brilliant white houses, hanging gardens, terraces, moucharabiehs or pierced balconies and tiled patios. From its rich past Évora retains several medieval and Renaissance palaces and mansions which in themselves provide a panoply of Portuguese architecture. The Alentejo capital is today the great agricultural market for the province and the base for several dependent industries (cork, leather, woolen carpets, painted furniture). Approx price €48 per person. Price does not include entrance fees or lunch. Departure from Lisbon to Óbidos, little town surrounded by medieval walls, overlooked by the castle, now converted into a Pousada. Inside the walls there are whitewashed houses and little streets in which here and there one can find indications of its history. We then continue to Alcobaça and visit the Abbey of Santa Maria de Alcobaça, a Cistercian-gothic abbey, containing the tombs of D. Pedro and D. Inês de Castro. Afterwards, visit to the Batalha Monastery built at the end of the 14th century in gothic and Manueline style. The tour then continues towards Fátima, the shrine where on the 13th May 1917, Virgin Mary appeared to three little shepherds and where the shrine of Our Lady of the Rosary of Fátima was erected. Approx €51 per person. Price does not include entrance fees or lunch.